Rastl, Peter and Oggolder, Christian 2019. Österreichische Mediengeschichte. p. 277. Denis, Jérôme 2018. Le travail invisible des données. Oppitz, Marcus and Tomsu, Peter 2018. Inventing the Cloud Century. p. 1. McKelvey, Fenwick and Driscoll, Kevin 2018. ARPANET and its boundary devices: modems, IMPs, and the inter-structuralism of infrastructures. Internet Histories, p. 1. Gießmann, Sebastian 2018. Money, Credit, and Digital Payment 1971/2014: From the Credit Card to Apple Pay. Administration & Society, Vol. 50, Issue. 9, p. 1259. Cortada, James W. 2018. Exploring How ICTs and Administration Are Entwined: The Promise of Information Ecosystems. Administration & Society, Vol. 50, Issue. 9, p. 1213. Fiedler, Arno and Thiel, Christoph 2018. Chancen europäischer Standards für die Zertifizierung?. Datenschutz und Datensicherheit - DuD, Vol. 42, Issue. 7, p. 434. Paloque-Bergès, Camille and Schafer, Valérie 2018. French memories about the ARPANET: a conversation with Michel Élie and Gérard Le Lann. Internet Histories, p. 1. Folaron, Deborah A. 2018. A History of Modern Translation Knowledge. Vol. 142, Issue. , p. 113. Fidler, Bradley 2017. Cybersecurity governance: a prehistory and its implications. Digital Policy, Regulation and Governance, Vol. 19, Issue. 6, p. 449. Bay, Morten 2017. What is “internet”? The case for the proper noun and why it is important. Internet Histories, Vol. 1, Issue. 3, p. 203. Fidler, Bradley and Acker, Amelia 2017. Metadata, infrastructure, and computer-mediated communication in historical perspective. Journal of the Association for Information Science and Technology, Vol. 68, Issue. 2, p. 412. Bain, Carmen and Selfa, Theresa 2017. Non-GMO vs organic labels: purity or process guarantees in a GMO contaminated landscape. Agriculture and Human Values, Vol. 34, Issue. 4, p. 805. Driscoll, Kevin and Paloque-Berges, Camille 2017. Searching for missing “net histories”. Internet Histories, Vol. 1, Issue. 1-2, p. 47. Bandini, Gianfranco 2017. School Memories. p. 143. Smithies, James 2017. The Digital Humanities and the Digital Modern. p. 113. Smithies, James 2017. The Digital Humanities and the Digital Modern. p. 203. Russell, Andrew L. 2017. Hagiography, revisionism & blasphemy in Internet histories. Internet Histories, Vol. 1, Issue. 1-2, p. 15. Frederick, Gregory S 2017. Open Communication Standards for Energy Storage and Distributed Energy Resources. Current Sustainable/Renewable Energy Reports, Vol. 4, Issue. 4, p. 191. How did openness become a foundational value for the networks of the twenty-first century? 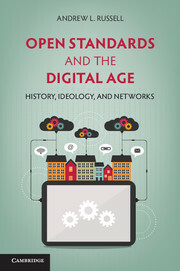 Open Standards and the Digital Age answers this question through an interdisciplinary history of information networks that pays close attention to the politics of standardization. For much of the twentieth century, information networks such as the monopoly Bell System and the American military's Arpanet were closed systems subject to centralized control. In the 1970s and 1980s however, engineers in the United States and Europe experimented with design strategies to create new digital networks. In the process, they embraced discourses of 'openness' to describe their ideological commitments to entrepreneurship, technological innovation, and participatory democracy. The rhetoric of openness has flourished - for example, in movements for open government, open source software, and open access publishing - but such rhetoric also obscures the ways the Internet and other 'open' systems still depend heavily on hierarchical forms of control. Bachman, Charles. Oral history interview by Andrew L. Russell, April 9, 2011, IEEE Computer Society History Committee, available from . Baran, Paul. Oral history interview by David Hochfelder, October 24, 1999, IEEE History Center, Rutgers University, New Brunswick, New Jersey. Baran, Paul. Oral history interview by Judy E. O’Neill, March 5, 1990, Menlo Park, California. Charles Babbage Institute, University of Minnesota, Minneapolis. Cerf, Vinton. Oral history interview by Judy E. O’Neill, April 24, 1990, Reston, Virginia. Charles Babbage Institute, University of Minnesota, Minneapolis. Crocker, Steve. Oral history interview by Judy E. O’Neill, October 24, 1991, Glenwood, Maryland. Charles Babbage Institute, University of Minnesota, Minneapolis. Danthine, Andre. Oral history interview by Andrew L. Russell, April 6, 2012, Liege, Belgium. Charles Babbage Institute, University of Minnesota, Minneapolis. Day, John. Oral history interview by James Pelkey, July 11, 1988. Courtesy of James Pelkey. Déspres, Rémi. Oral history interview by Valérie Schafer, May 16, 2012, Paris, France. Charles Babbage Institute, University of Minnesota, Minneapolis. Gien, Michel. Oral history interview by Andrew L. Russell, April 3, 2012, Paris, France. Charles Babbage Institute, University of Minnesota, Minneapolis. Grangé, Jean-Louis. Oral history interview by Andrew L. Russell, April 3, 2012, Paris, France. Charles Babbage Institute, University of Minnesota, Minneapolis. Kahn, Robert. Oral history interview by Judy E. O’Neill, April 24, 1990, Reston, Virginia. Charles Babbage Institute, University of Minnesota, Minneapolis. Le Lann, Gérard. Oral history interview by Andrew L. Russell, April 3, 2012, Paris, France. Charles Babbage Institute, University of Minnesota, Minneapolis. Levilion, Marc E. Oral history interview by Andrew L. Russell, April 2, 2012, Paris, France. Charles Babbage Institute, University of Minnesota, Minneapolis. Licklider, J. C. R. Oral history interview by William Aspray and Arthur L. Norberg, October 28, 1988, Cambridge, Massachusetts. Charles Babbage Institute, University of Minnesota, Minneapolis. Mills, David A. Oral history interview by Andrew L. Russell, February 26, 2004, Newark, Delaware. Charles Babbage Institute, University of Minnesota, Minneapolis. Naffah, Najah. Oral history interview by Andrew L. Russell, April 2, 2012, Paris, France. Charles Babbage Institute, University of Minnesota, Minneapolis. Pouzin, Louis. Oral history interview by Andrew L. Russell, April 2, 2012, Paris, France. Charles Babbage Institute, University of Minnesota, Minneapolis. Roberts, Lawrence G. Oral history interview by Arthur L. Norberg, April 4, 1989, San Francisco, California. Charles Babbage Institute, University of Minnesota, Minneapolis. Ruina, Jack. Oral history interview by William Aspray, 20 April 1989, Cambridge, Massachusetts. Charles Babbage Institute, University of Minnesota, Minneapolis. Strassburg, Bernard. Oral history interview by James Pelkey, May 3, 1988, Washington, DC. Taylor, Robert. Oral history interview by William Aspray, February 28, 1989, San Francisco, California. Charles Babbage Institute, University of Minnesota, Minneapolis. Zimmermann, Hubert. Oral history interview by James Pelkey, May 25, 1988. Zimmermann, Hubert. Oral history interview with Mariann Unterluggauer, July 14, 2005. Abbate, Janet. Inventing the Internet. Cambridge, MA: The MIT Press, 1999. Abbate, Janet. “Government, Business, and the Making of the Internet.” Business History Review 75 (2001): 147–176. Abbate, Janet. “Privatizing the Internet: Competing Visions and Chaotic Events, 1987–1995.” IEEE Annals of the History of Computing 32 (2010): 10–22. Agnew, Paul Gough. “How Business Is Policing Itself.” The Nation’s Business (December 1925), 41–43. Agnew, Paul Gough. “A Step Toward Industrial Self-Government.” The New Republic (March 17, 1926), 92–95. Agnew, Paul Gough. “Twenty Years of Standardization.” Industrial Standardization (December 1938): 229–237. Akera, Atsushi. “Voluntarism and the Fruits of Collaboration: The IBM User Group, Share.” Technology and Culture 42 (2001): 710–736. Aldrich, Mark. Safety First: Technology, Labor, and Business in the Building of American Work Safety, 1870–1939. Baltimore: The Johns Hopkins University Press, 1997. Band, Jonathan. “Competing Definitions of ‘Openness’ in the NII.” In Kahin, Brian and Abbate, Janet, eds. Standards Policy for Information Infrastructure. Cambridge, MA: The MIT Press, 1995. Bartky, Ian R.Selling the True Time: Nineteenth-Century Timekeeping in America. Stanford, CA: Stanford University Press, 2000. Botein, Stephen. “‘Meer Mechanics’ and an Open Press: The Business and Political Strategies of Colonial American Printers.” Perspectives in American History 9 (1975): 127–225. Bowker, Geoffrey and Star, Susan Leigh. Sorting Things Out: Classification and Its Consequences. Cambridge, MA: The MIT Press, 1999. Bradner, Scott. “The Internet Engineering Task Force.” In DiBona, Chris, Ockman, Sam, and Stone, Mark, eds. Open Sources: Voices from the Open Source Revolution. Cambridge, MA: O’Reilly, 1999. Busch, Lawrence. Standards: Recipes for Reality. Cambridge, MA: The MIT Press, 2011. Büthe, Tim. “Engineering Uncontestedness? The Origin and Institutional Development of the International Electrotechnical Commission (IEC).” Business & Politics 12 (2010). Campbell-Kelly, Martin and Garcia-Swartz, Daniel D.. “The History of the Internet: The Missing Narratives.” Journal of Information Technology 28 (2013): 18–33. Cargill, Carl. Open Systems Standardization: A Business Approach. Upper Saddle River, NJ: Prentice-Hall PTR, 1997. Castells, Manuel. The Rise of the Network Society. Cambridge, MA: Blackwell Publishers, 1996. Ceruzzi, Paul E.A History of Modern Computing. Cambridge, MA: The MIT Press, 1998. Chandler, Jr., Alfred D.The Visible Hand: The Managerial Revolution in American Business. Cambridge, MA: The Belknap Press of Harvard University Press, 1977. Chandler, Jr., Alfred D. and Cortada, James W., eds. A Nation Transformed by Information: How Information Has Shaped the United States from Colonial Times to the Present. New York: Oxford University Press, 2000. Chesbrough, Henry. Open Innovation: The New Imperative for Creating and Profiting from Technology. Boston: Harvard Business Review Press, 2003. Chiet, Ross E.Setting Safety Standards: Regulation in the Public and Private Sectors. Berkeley: University of California Press, 1990. Chumas, Sophie J., ed. Directory of United States Standardization Activities. Washington, DC: U. S. Department of Commerce, National Bureau of Standards, 1975. Cochrane, Rexmond. Measures for Progress: A History of the National Bureau of Standards. Washington, DC: Department of Commerce, 1966. Computer Science and Telecommunications Board. Global Networks and Local Values: A Comparative Look at Germany and the United States. Washington, DC: National Academies Press, 2001. Cowhey, Peter F. and Aronson, Jonathan D.. Transforming Global Information and Communication Markets: The Political Economy of Innovation. Cambridge, MA: The MIT Press, 2009. Crocker, Dave. “Making Standards the IETF Way.” StandardView 1 (1993): 48–56. Cronon, William. Nature’s Metropolis: Chicago and the Great West. New York: W. W. Norton, 1991. Darnton, Robert. “An Early Information Society: News and Media in Eighteenth-Century Paris.” American Historical Review 105 (2000): 1–35. David, Paul A. “Clio and the Economics of QWERTY.” American Economic Review 75 (1985): 332–337. David, Paul A. “Standardization Policies for Network Technologies: The Flux between Freedom and Order Revisited.” In Hawkins, Richard, Mansell, Robin, and Skea, Jim, eds. Standards, Innovation and Competitiveness. Aldershot: Edward Elgar, 1995. David, Paul A. “Understanding the Emergence of ‘Open Science’ Institutions: Functionalist Economics in Historical Context.” Industrial and Corporate Change 13 (2004): 571–589. David, Paul A. and Greenstein, Shane. “The Economics of Compatibility Standards: An Introduction to Recent Research.” Economics of Innovation and New Technology 1 (1990): 3–41. David, Paul A. and Shurmer, Mark. “Formal Standards-Setting for Global Telecommunications and Information Services: Towards an Institutional Regime Transformation?” Telecommunications Policy 20 (1996): 789–815. David, Paul A. and Steinmueller, W. Edward. “Economics of Compatibility Standards and Competition in Telecommunication Networks.” Information Economics and Policy 6 (1994): 217–241. Day, John. Patterns in Network Architecture: A Return to Fundamentals. Upper Saddle River, NJ: Prentice-Hall PTR, 2007. DeNardis, Laura. Protocol Politics: The Globalization of Internet Governance. Cambridge, MA: The MIT Press, 2009. Déspres, Rémi. “X.25 Virtual Circuits – Transpac in France – Pre-Internet Data Networking.” IEEE Communications Magazine (November 2010), 40–46. DiMaggio, Paul J. and Powell, Walter W.. “The Iron Cage Revisited: Institutional Isomorphism and Collective Rationality in Organizational Fields.” American Sociological Review 48 (1983): 147–160. Downey, Gregory J. “Virtual Webs, Physical Technologies, and Hidden Workers: The Spaces of Labor in Information Internetworks.” Technology and Culture 42 (2001): 209–235. Downey, Gregory J.Telegraph Messenger Boys: Labor, Technology, and Geography, 1850–1950. New York: Routledge, 2002. Drake, William J. “The Internet Religious War.” Telecommunications Policy 17 (1993): 643–649. Ensmenger, Nathan. The Computer Boys Take Over: Computers, Programmers, and the Politics of Technical Expertise. Cambridge, MA: The MIT Press, 2010. Ensmenger, Nathan. “The Digital Construction of Technology.” Technology & Culture 53 (2012): 753–776. Flichy, Patrice. The Internet Imaginaire. Cambridge, MA: The MIT Press, 2007. Foucault, Michel. “What Is Critique?” In Ingram, David, ed. The Political. Malden, MA: Blackwell, 1978. Friedman, Thomas L.The World Is Flat: A Brief History of the Twenty-First Century. New York: Farrar, Straus and Giroux, 2005. Froomkin, A. Michael. “Habermas@Discourse.Net: Toward a Critical Theory of Cyberspace.” Harvard Law Review 116 (2003): 749–873. Galambos, Louis. “Technology, Political Economy, and Professionalization: Central Themes of the Organizational Synthesis.” Business History Review 57 (1983): 471–493. Galambos, Louis. “Theodore N. Vail and the Role of Innovation in the Modern Bell System.” Business History Review 66 (1992): 95–126. Galambos, Louis. “Recasting the Organizational Synthesis: Structure and Process in the Twentieth and Twenty-First Centuries.” Business History Review 79 (2005): 1–37. Galambos, Louis. The Creative Society – And the Price Americans Paid for It. New York: Cambridge University Press, 2012. Garcia, D. Linda. “Standard Setting in the United States: Public and Private Sector Roles.” Journal of the American Society for Information Science 43 (1992): 531–537. Garcia, D. Linda. “Standards for Standard Setting: Contesting the Organizational Field.” In Bolin, Sherrie, ed. The Standards Edge: Dynamic Tension. Ann Arbor, MI: Sheridan Press, 2004. Garnet, Robert W.The Telephone Enterprise: The Evolution of the Bell System’s Horizontal Structure, 1876–1909. Baltimore: The Johns Hopkins University Press, 1985. Goldsmith, Jack and Wu, Tim. Who Controls the Internet? Illusions of a Borderless World. New York: Oxford University Press, 2006. Gooday, Graeme J. N.The Morals of Measurement: Accuracy, Irony, and Trust in Late Victorian Electrical Practice. New York: Cambridge University Press, 2004. Grindley, Peter, Mowery, David C., and Silverman, Brian. “SEMATECH and Collaborative Research: Lessons in the Design of High-Technology Consortia.” Journal of Policy Analysis and Management 13 (1994): 723–758. Haigh, Thomas. “Software in the 1960s as Concept, Service, and Product.” IEEE Annals of the History of Computing 24 (2002): 5–13. Handley, Mark. “Why the Internet Only Just Works.” BT Technology Journal 24 (2006): 119–129. Hart, David M. “Herbert Hoover’s Last Laugh: The Enduring Significance of the ‘Associative State.’” Journal of Policy History 10 (1998): 419–444. Hart, David M. “Antitrust and Technological Innovation in the U. S.: Ideas, Institutions, Decisions, and Outcomes, 1890–2000.” Research Policy 30 (2001): 923–936. Hawkins, Richard. “The Rise of Consortia in the Information and Communication Technology Industries: Emerging Implications for Policy.” Telecommunications Policy 23 (1999): 159–173. Hawley, Ellis W. “Herbert Hoover, the Commerce Secretariat, and the Vision of an ‘Associative State,’ 1921–1928.” Journal of American History 61 (1974): 116–140. Heide, Lars. “The Danish Welding Institute and Force Technology, 1940–2005: Technical Standardization and the Shaping of Business.” Enterprises et Histoire 51 (2008): 57–68. Hoke, Donald R.Ingenious Yankees: The Rise of the American System of Manufactures in the Private Sector. New York: Columbia University Press, 1990. Houldsworth, Jack. “Standards for Open Network Operation.” Computer Communications 1 (1978): 5–12. Hounshell, David A.From the American System to Mass Production, 1800–1932. Baltimore: The Johns Hopkins University Press, 1984. Hughes, Thomas P. “The Evolution of Large Technological Systems.” In Bijker, Wiebe E., Hughes, Thomas P., and Pinch, Trevor, eds. The Social Construction of Technological Systems: New Directions in the Sociology and History of Technology. Cambridge, MA: The MIT Press, 1989. Jesiek, Brent K. Between Discipline and Profession: A History of Persistent Instability in the Field of Computer Engineering, circa 1951–2006. PhD dissertation, Virginia Polytechnic Institute and State University, 2006. John, Richard R. “Theodore N. Vail and the Civic Origins of Universal Service.” Business and Economic History 28 (1999): 71–81. John, Richard R. “Recasting the Information Infrastructure for the Industrial Age.” In Chandler, Alfred D., Jr. and Cortada, James W., eds. A Nation Transformed by Information: How Information Has Shaped the United States from Colonial Times to the Present. New York: Oxford University Press, 2000. John, Richard R.Network Nation: Inventing American Telecommunications. Boston: Harvard University Press, 2010. Kahin, Brian and Abbate, Janet, eds. Standards Policy for Information Infrastructure. Cambridge, MA: The MIT Press, 1995. Kahn, Robert E. “The Role of the Government in the Evolution of the Internet.” Communications of the ACM 37 (1994): 15–19. Kasson, John F.Civilizing the Machine: Technology and Republican Values in America, 1776–1900. New York: Hill and Wang, 1999. Katz, Michael L. and Shapiro, Carl. “Systems Competition and Network Effects.” The Journal of Economic Perspectives 8 (1994): 93–115. Kelty, Christopher M.Two Bits: The Cultural Significance of Free Software. Durham, NC: Duke University Press, 2008. Kindleberger, Charles P. “Standards as Public, Collective and Private Goods.” Kyklos 36 (1983): 377–396. Krechmer, Ken. “Open Standards Requirements.” International Journal of IT Standards and Standardization Research 4 (2006): 43–61. Krislov, Samuel. How Nations Choose Product Standards and Standards Change Nations. Pittsburgh, PA: University of Pittsburgh Press, 1997. Lamoreaux, Naomi R., Raff, Daniel M. G., and Temin, Peter. “Beyond Markets and Hierarchies: Toward a New Synthesis of American Business History.” American Historical Review 108 (2003): 404–433. Langlois, Richard N. “External Economies and Economic Progress: The Case of the Microcomputer Industry.” Business History Review 66 (1992): 1–50. Langlois, Richard N. “Modularity in Technology and Organization.” Journal of Economic Behavior & Organization 49 (2002): 19–37. Layton, Edwin T.The Revolt of the Engineers: Social Responsibility and the American Engineering Profession. Cleveland, OH: Press of Case Western Reserve University, 1971. Lee, Michelle K. and Lee, Mavis K.. “High Technology Consortia: A Panacea for America’s Competitiveness Problems?” Berkeley Technology Law Journal 6 (1992): 335–372. Lemley, Mark A. “Intellectual Property Rights and Standard-Setting Organizations.” California Law Review 90 (2002): 1889–1980. Libicki, Martin. Standards: The Rough Road to the Common Byte. Cambridge, MA: Harvard Program on Information Resources Policy, 1994. Lipartito, Kenneth. The Bell System and Regional Business: The Telephone in the South, 1877–1920. Baltimore: The Johns Hopkins University Press, 1989. Lipartito, Kenneth. “When Women Were Switches: Technology, Work, and Gender in the Telephone Industry, 1890–1920.” American Historical Review 99 (1994): 1074–1111. Lipartito, Kenneth. “‘Cutthroat’ Competition, Corporate Strategy, and the Growth of Network Industries.” Research on Technological Innovation, Management and Policy 6 (1997): 1–53. Lukasik, Stephen J. “Why the Arpanet Was Built.” IEEE Annals of the History of Computing 33 (2011): 4–21. MacDougall, Robert. “Long Lines: AT&T’s Long-Distance Network as an Organizational and Political Strategy.” Business History Review 80 (2006): 297–327. Malamud, Carl. Exploring the Internet: A Technical Travelogue. Englewood Cliffs, NJ: PTR Prentice Hall, 1992. Mattli, Walter and Büthe, Tim. “Setting International Standards: Technological Rationality or Primacy of Power?” World Politics 56 (2003): 1–42. Maxwell, Elliott. “Open Standards, Open Source, and Open Innovation: Harnessing the Benefits of Openness.” Innovations: Technology, Governance, Globalization 1 (2006): 119–176. McKenzie, Alexander. “INWG and the Conception of the Internet: An Eyewitness Account.” IEEE Annals of the History of Computing 33 (2011): 66–71. McMahon, A. Michal. The Making of a Profession: A Century of Electrical Engineering in America. New York: Institute of Electrical and Electronics Engineers, 1984. Metcalfe, J. S. and Miles, Ian. “Standards, Selection and Variety: An Evolutionary Approach.” Information Economics and Policy 6 (1994): 243–268. Morozov, Evgeny. The Net Delusion: The Dark Side of Internet Freedom. New York: Public Affairs, 2011. Moskowitz, Marina. Standard of Living: The Measure of the Middle Class in Modern America. Baltimore: The Johns Hopkins University Press, 2004. Mueller, Milton. Universal Service: Competition, Interconnection, and Monopoly in the Making of the American Telephone System. Cambridge, MA: The MIT Press and American Enterprise Institute, 1997. Mumford, Lewis. “Authoritarian and Democratic Technics.” Technology & Culture 5 (1964): 1–8. Murphy, Craig N. and Yates, JoAnne. The International Organization for Standardization (ISO): Global Governance through Voluntary Consensus. New York: Routledge, 2009. National Research Council. The Internet’s Coming of Age. Washington, DC: National Academy Press, 2000. Nissenbaum, Helen. “How Computer Systems Embody Values.” Computer (March 2001), 118–120. Noam, Eli. Telecommunications in Europe. New York: Oxford University Press, 1992. Noble, David F.America by Design: Science, Technology, and the Rise of Corporate Capitalism. New York: Oxford University Press, 1977. Nora, Simon and Minc, Alain. The Computerization of Society: A Report to the President of France. Cambridge, MA: The MIT Press, 1981. Norberg, Arthur L. and O’Neill, Judy E.. Transforming Computer Technology: Information Processing for the Pentagon, 1962–1986. Baltimore: The Johns Hopkins University Press, 1996. Nuechterlein, Jonathan and Weiser, Philip J.. Digital Crossroads: American Telecommunications Policy in the Internet Age. Cambridge, MA: The MIT Press, 2013. Nye, David E. “Shaping Communication Networks: Telegraph, Telephone, Computer.” Social Research 64 (1997): 1067–1091. Obama, Barack. “Transparency and Openness in Government.” The White House, . Accessed August 19, 2010. Olshan, Marc A. “Standards-Making Organizations and the Rationalization of American Life.” The Sociological Quarterly 34 (1993): 319–335. OpenStand. “The Modern Standards Paradigm – Five Key Principles.” . Accessed September 5, 2012. Oxman, Jason. “The FCC and the Unregulation of the Internet.” Federal Communications Commission Office of Plans and Policy Working Paper No. 31, July 1999. Padlipsky, M. A.The Elements of Networking Style and Other Animadversions on the Art of Intercomputer Networking. 2nd ed. Lincoln, NE: iUniverse, 2000. Pelkey, James. “Entrepreneurial Capitalism and the Emergence of Computer Communications, 1968–1988.” . Accessed September 8, 2012. Perry, John. The Story of Standards. New York: Funk & Wagnalls Company, 1955. Piscitello, David M. and Chapin, A. Lyman. Open Systems Networking: TCP/IP and OSI. Reading, MA: Addison-Wesley, 1993. Puffert, Douglas J.Tracks across Continents, Paths through History: The Economic Dynamics of Standardization in Railway Gauge. Chicago: University of Chicago Press, 2009. Pugh, Emerson W.Building IBM: Shaping an Industry and Its Technology. Cambridge, MA: The MIT Press, 1995. Raunig, Gerald. “What Is Critique? Suspension and Recomposition in Textual and Social Machines.” Transversal (2008), . Accessed January 17, 2012. Reagle, Jr., Joseph M.Good Faith Collaboration: The Culture of Wikipedia. Cambridge, MA: The MIT Press, 2010. Reck, Dickson, ed. National Standards in a Modern Economy. New York: Harper, 1956. Reich, Leonard S.The Making of Industrial Research: Science and Business at GE and Bell, 1876–1926. New York: Cambridge University Press, 1985. Rohlfs, Jeffrey. “A Theory of Interdependent Demand for a Communications Service.” Bell Journal of Economics and Management Science 5 (1974): 16–37. Rosenberg, Nathan. “Technological Change in the Machine Tool Industry, 1840–1910.” The Journal of Economic History 23 (1963): 414–443. Rosenzweig, Roy. “Wizards, Bureaucrats, Warriors, and Hackers: Writing the History of the Internet.” American Historical Review 103 (1998): 1530–1552. Russell, Andrew L. “Standardization in History: A Review Essay with an Eye to the Future.” In Bolin, Sherrie, ed. The Standards Edge: Future Generations. Ann Arbor, MI: Sheridan Books, 2005. Russell, Andrew L. “‘Rough Consensus and Running Code’ and the Internet-OSI Standards War.” IEEE Annals of the History of Computing 28 (2006a): 48–61. Russell, Andrew L. “Telecommunications Standards in the Second and Third Industrial Revolutions.” The Journal of the Communications Network 5 (2006b): 100–106. Russell, Andrew L. “Constructing Legitimacy: The W3C’s Patent Policy.” In DeNardis, Laura, ed. Opening Standards: The Global Politics of Interoperability. Cambridge, MA: The MIT Press, 2011. Russell, Andrew L. “Modularity: An Interdisciplinary History of an Ordering Concept.” Information & Culture: A Journal of History 47 (2012): 257–287. Rybczynski, Tony. “Commercialization of Packet Switching (1975–1985): A Canadian Perspective.” IEEE Communications Magazine (December 2009), 26–32. Saloner, Garth. “Economic Issues in Computer Interface Standardization.” Economics of Innovation and New Technology 1 (1990): 135–156. Salus, Peter H.Casting the Net: From ARPANET to INTERNET and Beyond. New York: Addison-Wesley Publishing Company, 1995. Schafer, Valérie. La France en Reseaux. Paris: Nuvis, 2012. Schmidt, Susanne K. and Werle, Raymund. Coordinating Technology: Studies in the International Standardization of Telecommunications. Cambridge, MA: The MIT Press, 1998. Schoechle, Timothy. Standardization and Digital Enclosure: The Privatization of Standards, Knowledge, and Policy in the Age of Global Information Technology. Hershey, PA: IGI Global, 2009. Schumpeter, Joseph A.Capitalism, Socialism, and Democracy. New York: Harper & Row, 1976 . Scott, W. Richard. Organizations: Rational, Natural, and Open Systems. Englewood Cliffs, NJ: Prentice-Hall, 1981. Scranton, Philip. Endless Novelty: Specialty Production and American Industrialization, 1865–1925. Princeton, NJ: Princeton University Press, 1997. Shapiro, Andrew L.The Control Revolution: How the Internet Is Putting Individuals in Charge and Changing the World We Know. New York: PublicAffairs, 1999. Shapiro, Carl and Varian, Hal. Information Rules: A Strategic Guide to the Network Economy. Boston: Harvard Business School Press, 1999. Shewart, W. A. “Nature and Origin of Standards of Quality.” Bell System Technical Journal 37 (1958): 1–22. Simcoe, Timothy S. “Open Standards and Intellectual Property Rights.” In Chesbrough, Henry, Vanhaverbeke, Wim, and West, Joel, eds. Open Innovation: Researching a New Paradigm. New York: Oxford University Press, 2006. Simon, Craig Lyle. Launching the DNS War: Dot-Com Privatization and the Rise of Global Internet Governance. PhD dissertation, University of Miami, 2006. Sinclair, Bruce. “At the Turn of a Screw: William Sellers, the Franklin Institute, and a Standard American Thread.” Technology & Culture 10 (1969): 20–34. Sinclair, Bruce. A Centennial History of the American Society of Mechanical Engineers, 1880–1980. Toronto: University of Toronto Press, 1980. Sirbu, Marvin A. and Zwimpfer, Laurence E.. “Standards Setting for Computer Communication: The Case of X.25.” IEEE Communications Magazine 23 (1985): 35–44. Slaton, Amy E.Reinforced Concrete and the Modernization of American Building, 1900–1930. Baltimore: The Johns Hopkins University Press, 2001. Slaton, Amy and Abbate, Janet. “The Hidden Lives of Standards: Technical Prescriptions and the Transformation of Work in America.” In Allen, Michael Thad and Hecht, Gabrielle, eds. Technologies of Power: Essays in Honor of Thomas Parke Hughes and Agatha Chipley Hughes. Cambridge, MA: The MIT Press, 2001. Smith, George David. The Anatomy of a Business Strategy: Bell, Western Electric, and the Origins of the American Telephone Industry. Baltimore: The Johns Hopkins University Press, 1985. Stango, Victor. “The Economics of Standards Wars.” Review of Network Economics 3 (2004): 1–19. Suber, Peter. Open Access. Cambridge, MA: The MIT Press, 2012. Tate, Jay. “National Varieties of Standardization.” In Hall, Peter A. and Soskice, David, eds. Varieties of Capitalism: The Institutional Foundations of Comparative Advantage. New York: Oxford University Press, 2001. Temin, Peter with Galambos, Louis. The Fall of the Bell System: A Study in Prices and Politics. New York: Cambridge University Press, 1987. Thompson, George V. “Intercompany Technical Standardization in the Early American Automobile Industry.” The Journal of Economic History 14 (1954): 1–20. Toth, Robert, ed. Standards Activities of Organizations in the United States. Gaithersburg, MD: National Institute of Standards and Technology, 1996. United States Congress, Office of Technology Assessment. Global Standards: Building Blocks for the Future. Washington, DC: U.S. Government Printing Office, 1992. Updegrove, Andrew. “A Work in Progress: Government Support for Standard Setting in the United States, 1980–2004.” Consortium Standards Bulletin 4 (2005): 1–8. Updegrove, Andrew. “ICT Standards Today: A System Under Stress.” In DeNardis, Laura, ed. Opening Standards: The Global Politics of Interoperability. Cambridge, MA: The MIT Press, 2011. Usselman, Steven W. “IBM and Its Imitators: Organizational Capabilities and the Emergence of the International Computer Industry.” Business and Economic History 22 (1993): 1–35. Usselman, Steven W.Regulating Railroad Innovation: Business, Technology, and Politics in America, 1840–1920. New York: Cambridge University Press, 2002. Usselman, Steven W. “Public Policies, Private Platforms: Antitrust and American Computing.” In Coopey, Richard, ed. Information Technology Policy: An International History. New York: Oxford University Press, 2004. Verman, Lal C.Standardization: A New Discipline?Hamden, CT: Archon Books, 1973. Vietor, Richard H. K.Contrived Competition: Regulation and Deregulation in America. Cambridge, MA: Belknap Press, 1994. Vinselr, Lee Jared. “The Crusade for Credible Energy Information and Analysis in the United States, 1973–1982.” History and Technology 28 (2012): 149–176. Vincent, Charles and Camp, L. Jean. “Looking to the Internet for Models of Governance.” Ethics and Information Technology 6 (2004): 161–173. von Bertalanffy, Ludwig. “An Outline of General System Theory.” British Journal for the Philosophy of Science 1 (1950a): 139–164. von Bertalanffy, Ludwig. “The Theory of Open Systems in Physics and Biology.” Science New Series 111 (1950b): 23–29. von Burg, Urs. The Triumph of Ethernet: Technological Communities and the Battle for the LAN Standard. Stanford, CA: Stanford University Press, 2001. Waldrop, M. Mitchell. The Dream Machine: J. C. R. Licklider and the Revolution That Made Computing Personal. New York: Viking, 2001. Wasserman, Neil H.From Invention to Innovation: Long-Distance Telephone Transmission at the Turn of the Century. Baltimore: The Johns Hopkins University Press, 1985. Weber, Steven. The Success of Open Source. Boston: Harvard University Press, 2004. Weiser, Philip J. “Law and Information Platforms.” Journal of Telecommunications and High Technology Law 1 (2002), 1–35. Weiser, Philip J. “The Internet, Innovation, and Intellectual Property Policy.” Columbia Law Review 103 (2003): 534–613. Weiss, Martin and Cargill, Carl F.. “Consortia in the Standards Development Process.” Journal of the American Society for Information Science 43 (1992): 559–565. Werle, Raymund and Iversen, Eric J.. “Promoting Legitimacy in Technical Standardization.” Science, Technology & Innovation Studies 2 (2006): 19–39. West, Joel. “Seeking Open Infrastructure: Contrasting Open Standards, Open Source, and Open Innovation.” First Monday 12 (June 2007), (accessed September 16, 2013). Whitney, Albert W.The Place of Standardization in Modern Life. Washington, DC: Government Printing Office, 1924. Wiebe, Robert H.The Search for Order: 1877–1920. New York: Hill and Wang, 1967. Winner, Langdon. “Do Artifacts Have Politics?” Daedelus 109 (1980): 121–136. Yates, JoAnne. Control through Communication: The Rise of System in American Management. Baltimore: The Johns Hopkins University Press, 1989.